If you have not read Part 1, A Brief Backdrop of My Journey or Part 2, The Hebrew Word Sheol, please do so before reading this Part 3. Once again, I’ll repeat myself and say that mankind’s present is enormously influenced by the past and by other cultures. Christianity’s modern ideas of hell have mostly come from Greek and Roman mythology, the poetic (and fictional) writing of Dante Alighieri’s (1265-1321) Inferno, and from ancient church leaders of Roman Catholicism and so called “church fathers” who had the wrong perception of God’s character, held an unhealthy fear of God, and/or wanted to have power and control over people. In Part 2, I explained the Hebrew word Sheol which is used in the Old Testament. In this Part 3, I will explain the Greek word Hades, which is the equivalent to Sheol. The literal definition of Hades is “unperceived” or “unseen”. --The KJV erroneously translates it as “hell” 10 times and more appropriately as “grave” 1 time. --The NKJV translates it as “Hades” all 11 times. 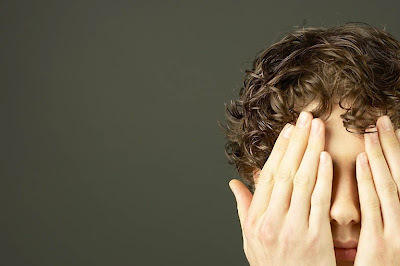 --The CLNT translates it as “unseen” in every instance. --The Dahbar translates it as “Hades” in every instance. Is Hades the place of burning fire and eternal torment? No, just like Sheol, Hades is a place the living cannot perceive. Hades is the place where the dead do not perceive anything. They are peacefully asleep and awaiting a future resurrection. The following information will be brief in nature. I could spend much more time giving further details and providing additional references on how the influence of how pagan beliefs, folklore, and mistranslations have encouraged modern ideas about hell and torment. However, I don't want to bog down this post and prefer to stick discussing what Hades really is instead of what it isn't. 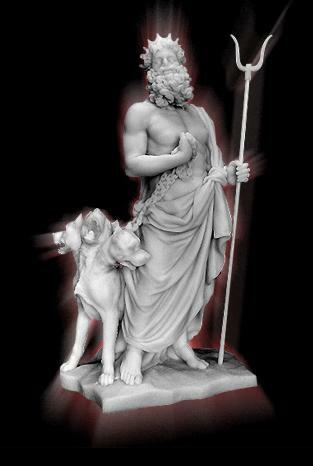 In Greek mythology, the god Hades (also known as Pluto) rules the underworld. Greek mythology tells the story that Hades and his brothers, Poseidon and Zeus, drew lots for who would rule the sky, the sea, and the underworld. Hades earned the lot for the underworld and thus became ruler of a place which was known to be unseen and where all dead souls went after death—the good, the bad, and the in-between souls. The unseen underworld of the dead also came to be called Hades. The Greeks were afraid of ending up in Hades, not because they necessarily believed it to be a place of torment, but because it was place completely unknown to the land of the living. People fear what they don't know and what they don't understand, and the underworld of Hades was described as a dark and gloomy place with different sections. The Greeks were also afraid of the god Hades because he was said to be a powerful and stern ruler over the dead (as described in the Iliad by Homer). In later mythology, ideas were introduced that mortals were judged in Hades; the good mortals receiving rewards and the bad mortals receiving curses. To Plato, the god of the underworld was "an agent in th[e] beneficent cycle of death and rebirth" meriting worship under the name of Plouton, a giver of spiritual wealth. In the dialogue Cratylus, Plato has Socrates explain the etymology of Plouton, saying that Pluto gives wealth (ploutos), and his name means "giver of wealth, which comes out of the earth beneath." Because the name Hades is taken to mean "the invisible," people fear what they cannot see; although they are in error about the nature of this deity's power, Socrates says, "the office and name of the God really correspond": He is the perfect and accomplished Sophist, and the great benefactor of the inhabitants of the other world; and even to us who are upon earth he sends from below exceeding blessings. For he has much more than he wants down there; wherefore he is called Pluto (or the rich). Note also, that he will have nothing to do with men while they are in the body, but only when the soul is liberated from the desires and evils of the body. Now there is a great deal of philosophy and reflection in that; for in their liberated state he can bind them with the desire of virtue, but while they are flustered and maddened by the body, not even father Cronos himself would suffice to keep them with him in his own far-famed chains. 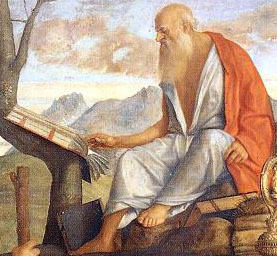 In the year 382 AD, Pope Damascus appointed the priest Eusebius Sophronius Hieronymus (commonly known as St. Jerome) with the task of revising the Vetus Latina (the Old Latin Bible). Jerome set about the work and did more translating than what had been initially requested of him, completing what became known as the Latin Vulgate, along with various of his own commentaries. Jerome gave account that he translated the Old Testament directly from the Hebrew (Tanakh) scriptures; however, that fact is questioned when considering Jerome’s knowledge of ancient Hebrew and his extensive use of Greek materials and writing style. Some believe he used the Hexapla extensively, a six version edition of the Old Testament compiled by Origen of Alexandria. During his translation work, Jerome made the decision to freely use Latin forms of “inferno” as a translation for Sheol and Hades. I have no idea why. My personal conclusion to Jerome’s faulty translating is that, as all human beings are prone to be, he was greatly influenced by the beliefs of the culture around him, by what he read and studied, and by the beliefs and teachings of his contemporaries whom he admired. He was clearly deceived about the reality of Sheol and Hades and how they have nothing to do with an inferno. Eusebius Sophronius Hieronymus was born at Stridon around 347. He was not baptized until about 360 or 366, when he had gone to Rome with his friend Bonosus (who may or may not have been the same Bonosus whom Jerome identifies as his friend who went to live as a hermit on an island in the Adriatic) to pursue rhetorical and philosophical studies. He studied under the grammarian Aelius Donatus. There Jerome learned Latin and at least some Greek, though probably not the familiarity with Greek literature he would later claim to have acquired as a schoolboy. As a student in Rome, he engaged in the superficial escapades and wanton behaviour of students there, which he indulged in quite casually but for which he suffered terrible bouts of repentance afterwards. To appease his conscience, he would visit on Sundays the sepulchers of the martyrs and the Apostles in the catacombs. This experience would remind him of the terrors of hell:"Often I would find myself entering those crypts, deep dug in the earth, with their walls on either side lined with the bodies of the dead, where everything was so dark that almost it seemed as though the Psalmist's words were fulfilled, Let them go down quick into Hell. Here and there the light, not entering in through windows, but filtering down from above through shafts, relieved the horror of the darkness. But again, as soon as you found yourself cautiously moving forward, the black night closed around and there came to my mind the line of Vergil, "Horror ubique animos, simul ipsa silentia terrent'". Jerome used a quote from Vergil — "On all sides round horror spread wide; the very silence breathed a terror on my soul." — to describe the horror of hell. Jerome initially used classical authors to describe Christian concepts such as hell that indicated both his classical education and his deep shame of their associated practices, such as pederasty which was found in Rome. Although initially skeptical of Christianity, he was eventually converted. Notice that Jerome thought highly enough of the Roman poet Virgil to quote him and his ideas. Initially, Jerome’s Latin Vulgate translation was scoffed at and not taken seriously. However, later it was much-admired and became the Latin version of the Bible that has had the greatest influence upon modern Bible translations. For over a thousand years it was the primary source for other Bible versions authorized and printed in Western Europe. One of those being the King James Version. In addition to Jerome’s mistranslation of Sheol and Hades as a reason for where we get modern day misconceptions about “hell”, we can look at the influence of Dante Alighieri’s (1265-1290 AD) poetic writing titled Divine Comedy. Divine Comedy is Dante’s imaginary and fictitious story of his wishful ideas about heaven, hell, and purgatory. Dante’s writing was greatly influenced by his views of the current political situation in Italy, his involvement in those politics (he even faced exile in 1302), and his perceptions of who were good or bad people and leaders and the ultimate fate that any of those people deserved according to their deeds. for through the Law comes the knowledge of sin. Dante’s personal life and the writing of The Comedy were greatly influenced by the politics of late-thirteenth-century Florence. The struggle for power in Florence was a reflection of a crisis that affected all of Italy, and, in fact, most of Europe, from the twelfth century to the fourteenth century—the struggle between church and state for temporal authority. The main representative of the church was the pope, while the main representative of the state was the Holy Roman Emperor. In Florence, these two loyalties were represented by the Guelph party, which supported the papacy, and the Ghibelline party, which supported imperial power. The last truly powerful Holy Roman Emperor, Frederick II, died in 1250, and by Dante’s time, the Guelphs were in power in Florence. By 1290, however, the Guelphs had divided into two factions: the Whites (Dante’s party), who supported the independence of Florence from strict papal control, and the Blacks, who were willing to work with the pope in order to restore their power. Under the direction of Pope Boniface VIII, the Blacks gained control of Florence in 1301. Dante, as a visible and influential leader of the Whites, was exiled within a year. Dante became something of a party unto himself after his exile. His attitudes were, at times, closer to those of a Ghibelline than a Guelph, so much did he dislike Boniface. The pope, as well as a multitude of other characters from Florentine politics, has a place in the Hell that Dante depicts in Inferno—and not a pleasant one. Dante’s “Inferno” tells the story of Dante exploring the depths of hell along with his companion, the ancient Roman poet, Virgil (70-19 BC). I find it quite interesting and enlightening that both Jerome and Dante admired the poet Virgil, were very familiar with his work, and seemed to put their trust in his ideas and beliefs. It is clear to see the influence the ancient poets and their pagan, mythological beliefs had upon those who read and studied their work and how in turn that affected future generations. The poem starts on Maundy Thursday in the year 1300. The narrator, Dante himself, is thirty-five years old, and thus "halfway along our life's path" (Nel mezzo del cammin di nostra vita)—half of the Biblical life expectancy of seventy (Psalms 89:10, Vulgate). The poet finds himself lost in a dark wood in front of a mountain, assailed by three beasts (a lion, a lonza [usually rendered as "leopard" or "leopon"], and a she-wolf) he cannot evade. Unable to find the "straight way" (diritta via, also translatable as "right way") to salvation, he is conscious that he is ruining himself and falling into a "deep place" (basso loco) where the sun is silent (l sol tace). Dante is at last rescued by the Roman poet Virgil, who claims to have been sent by Beatrice, and the two of them begin their journey to the underworld. Each sin's punishment in Inferno is a contrapasso, a symbolic instance of poetic justice; for example, fortune-tellers have to walk forward with their heads on backward, unable to see what is ahead, because they tried to see the future through forbidden means. Such a contrapasso "functions not merely as a form of divine revenge, but rather as the fulfilment of a destiny freely chosen by each soul during his or her life." Dante passes through the gate of Hell, which bears an inscription, the ninth (and final) line of which is the famous phrase "Lasciate ogne speranza, voi ch'intrate", or "Abandon all hope, ye who enter here." Before entering Hell completely, Dante and his guide see the Uncommitted, souls of people who in life did nothing, neither for good nor evil; among these Dante recognizes either Pope Celestine V or Pontius Pilate (the text is ambiguous). Mixed with them are outcasts who took no side in the Rebellion of Angels. These souls are neither in Hell nor out of it, but reside on the shores of the Acheron, their punishment to eternally pursue a banner (i.e. self interest) while pursued by wasps and hornets that continually sting them as maggots and other such insects drink their blood and tears. This symbolizes the sting of their conscience and the repugnance of sin. This can also be seen as a reflection of the spiritual stagnation they lived in. As with the Purgatorio and Paradiso, the Inferno has a structure of 9+1=10, with this "vestibule" different in nature from the nine circles of Hell, and separated from them by the Acheron. 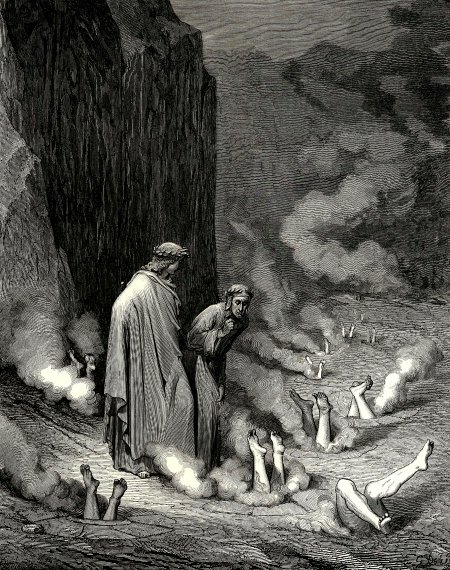 After passing through the "vestibule," Dante and Virgil reach the ferry that will take them across the river Acheron and to Hell proper. The ferry is piloted by Charon, who does not want to let Dante enter, for he is a living being. Virgil forces Charon to take him by means of another famous line: Vuolsi così colà dove si puote, which translates to "So it is wanted there where the power lies," referring to the fact that Dante is on his journey on divine grounds. The wailing and blasphemy of the damned souls entering Charon's boat contrast with the joyful singing of the blessed souls arriving by ferry in the Purgatorio. However, the actual passage across the Acheron is undescribed since Dante faints and does not wake up until he is on the other side. The more I read about Dante’s “Inferno” full of its pagan and mythological beliefs along with understanding Dante’s obvious desire to seek a type of revenge upon those he despises by envisioning them facing an ultimate destiny of torment, the more upset I become at the thought that this man’s fictitious story has had so much influence upon Christ-believers and in the promotion of the lie of hell and torment. I really don’t care one bit how acclaimed Dante’s writing style and poetry is and what it meant for the literature world. Dante’s writings are FICTITIOUS! Dante’s writings are a work of HIS MIND and of HIS WISHFUL THINKING! They are not Scripture. Dante’s writings are not a reliable source of insight into God’s mind or ultimate plan for mankind. --Pagan and mythological beliefs and fictitious, poetical writings of the Romans and Greeks about the god Hades and his rule over the underworld where they believe the dead are conscious and sternly ruled (and judged) by Hades. --Jerome's Latin Vulgate translation of the Bible and his erroneous use of "inferno" for the words Sheol and Hades. Jerome was a Roman Catholic priest who's ideas and beliefs were heavily influenced by the teachings, control, and power of his religion and by the Greek culture, poets, and philosophers. --Dante Alighieri's Divine Comedy, a literature masterpiece by certain standards (but also a completely fictitious story! ), places countless of horrible ideas in the minds of people about what tortures and torments in Hades (or hell) would be like. Dante's imaginary story was inspired by his religious and political experiences and by the culture, poets, and philosophers. The above influences have played an immense role in generation after generation that have followed. They have played their role in promoting a lie. The Scriptures do not give us any information about Hades being anything other than that. Hades is a place of knowing nothing and seeing nothing. Hades is the equivalent of the Hebrew word Sheol. --The Son of God, Jesus, was put to death. --Because of God’s sovereign plan, will, and power, it was impossible for the power of death to hold Jesus and keep Him dead. 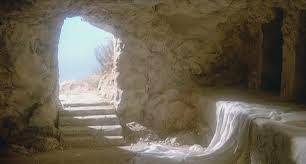 --God resurrected Jesus before His body experienced any decay. “Because He is at my right hand, I will not be shaken. --David stated that God would not abandon the soul in Sheol/Hades. --David foretold the body of Jesus would not decay. --David’s body decayed in the tomb. He has not yet ascended into heaven (Peter clearly states that in Acts 2:34 above). In Acts 2, Peter confirms David's prophecy that Christ Jesus now sits at the right hand of God, waiting for God to complete His plan to make all His (Christ’s) enemies a footstool for His (Christ’s) feet. It is clear to see the words Sheol and Hades are counterparts. Neither word refers to a place called hell full of torment and torture. Both words refer to the grave; the place where the dead lie peacefully asleep. Jesus was dead, but now He lives and sits at the right hand of God as Christ Jesus, the first one (Firstfruit) of the resurrection of the dead. Christ holds the keys to death and the grave. The gates (or power) of the death and the grave [Hades] will not prevail (Matthew 16:18). Death and the grave (Sheol/Hades) will, one day, lose all their power. the Firstfruit of those who are reposing [lying asleep]. also, comes the resurrection of the dead. thus also, in Christ, shall all be vivified. whenever He should be nullifying all sovereignty and all authority and power. until He should be placing all His enemies under His feet. The last enemy is being abolished: death. For He [God] subjects all under His [Christ’s] feet. Who subjects all to Him [Christ]. As in Adam all are dying, so in Christ all will be vivified. One future day, death will be abolished and God will be all in all. Amen. So it will be. Glory to the mighty God Who is truly sovereign over all. In the upcoming Part 4 of Unveiling the Myth of Hell and Eternal Torment, I will explain another word which has been erroneously translated as hell: Gehenna (a word spoken multiple times by Jesus). Excellent post Mary! Keep up the good work.